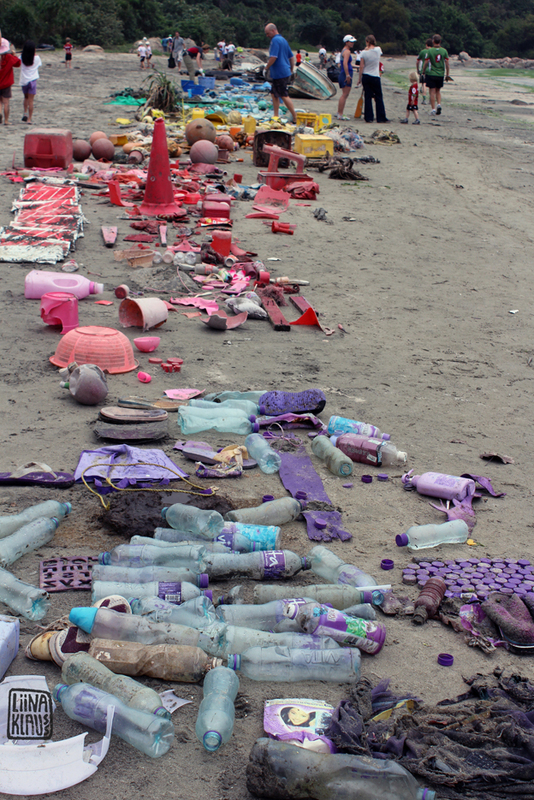 this is the first installation from trash i did in 2011. i was camping with my family on a secluded beach on south lantau when i noticed the trash that's been washed up and caught up in the undergrowth. coming from a background of a painter i started sorting the trash by colours and putting it into the shape of a colour wheel. and this is how big the installation gets in 2013! in anticipation of earth day 2013 environmental activist tracey read (www.plasticfreeseas.org) and me join forces to do the biggest installation ever. i call these outdoor installations "chinese landscape" or "垃圾山水" (trash mountain water): the reality of chinese nature as it is at this point in time. 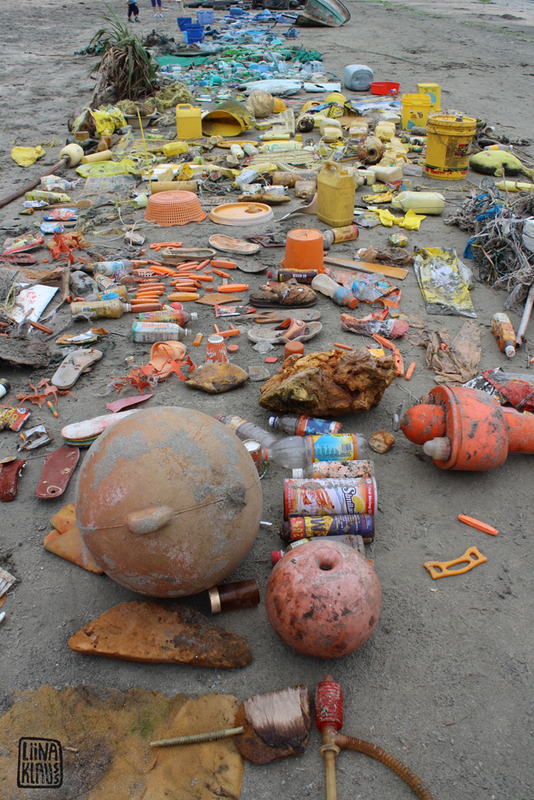 the landscape is still as beautiful as on any ancient ink drawing, but there is a new element: 垃圾 = trash. 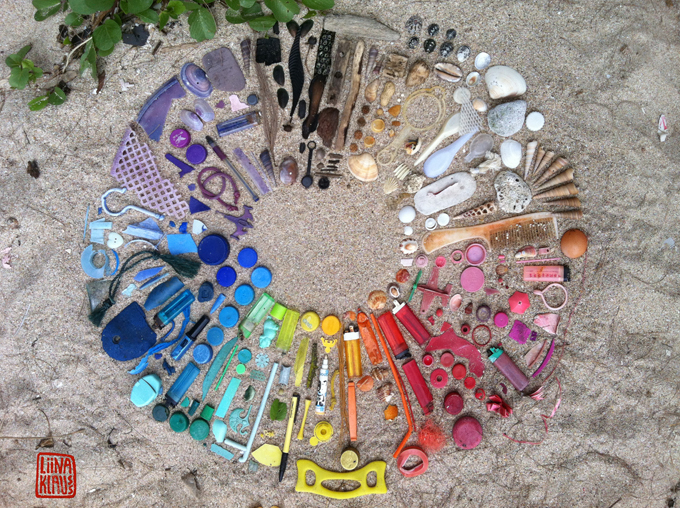 for earth day 2013 my concept is to cover the whole beach with trash, sort it by colour and lay it out like a rainbow. 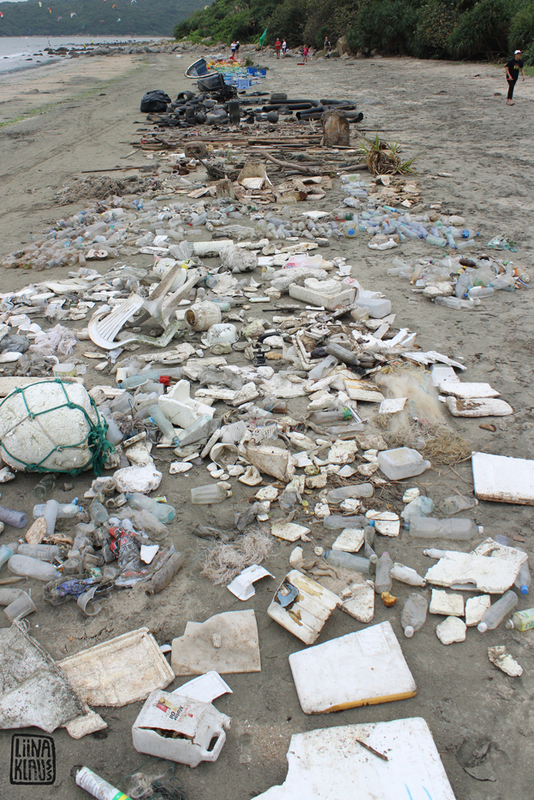 in 6 hours tracey, me and around 50 volunteers bring to light the volume of 85 big rubbish bags full of trash, not including two refrigerators, half a boat, a government rubbish bin, construction pipes and ropes for shipping... and sadly that's only a fraction of the garbage on this beach. the most important message i want to convey with my "chinese landscape/垃圾山水" is to open your eyes to the massive problems of hong kong's excessive consumerist society. and at the same time i want you to see the beauty of hong kong's nature. the best and most direct way to experience this is to volunteer at a "chinese landscape/垃圾山水". you get in physical contact with the left-overs of our consumerist society and you get to spend the whole day in the magnificent outdoors of hong kong. this is a much deeper experience than to just grasping it on an intellectual level. when people look at my photographs they usually perceive them as being beautiful and pleasing. only later comes the recognition that the colours are actually made up from lots of different pieces of trash.and that's hopefully the moment we start thinking about our consumerist habits, our life styles, our relationship to nature.